Edited by James Hepworth and Gregory McNamee. This book collects essays and articles by Ed, and some interviews with him. Many thanks goes to one of this books editors, Gregory McNamee, for donating this book. First issued in 1985, this book's revised and updated edition fills a gap made wider by Abbey's untimely death in March 1989. A phrase from Whitman, "Resist much, obey little", summarizes much in the life of Edward Abbey. A man of many faces and many opinions, he was nearly impossible to "get a fix on". In this volume his friends and contemporaries assemble their own literary responses to the mercurial Abbey, revealing (perhaps inadvertently) a good deal about themselves in the process. Stalwart and opiniated as he was, Abbey's quicksilver mind was just as likely to leave readers gazing blankly at a handful of enigmatic shards. Now the writer is gone, but the intrigue lives on. 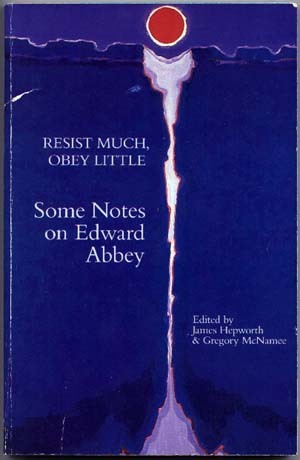 A good part of Ed Abbey's legacy to us is encapsulated in Resist Much, Obey Little. It is an introduction to his literary world and a kaleidoscope of insights into the man and his work. For not only was he a staunch preservationist and controversial political activist, he was first and foremost a dedicated and conscientious writer. And the other way around; we may enjoy his books for the sheer literary pleasure, yet we cannot escape the eleventh-hour alarm that Abbey sounded. Wendell Berry reflects on Abbey's reputation as an unpredictable gadfly who often seems to not meet his readers' expectations. William Eastlake humorously derides the Eastern Literary Junta's indifference to his friends accomplishments. Barry Lopez describes his first encounter with Edward Abbey and discusses the responsibility of a writer to his readers. Richard Shelton asks why Abbey's Desert Solitaire so stubbornly defies categorization. Gary Snyder searches for the common ground between them as people and artists. Sam Hamill attempts to show the similarities between Abbey's philosophy anf the traditions of the Far East. Robert Houston reaffirmes wilderness as a legitimate source of inspiration - for Abbey and others. Resist Much, Obey Little also includes Gregory McNamee on Abbey's politics, Diane Wakoski on his "vision", David Remley on Fire on the Mountain, Nancy Mairs on Abbey as a teacher along with several revealing interviews conducted by James Hepworth and others, giving Abbey a chance to speak for himself. Abbey, Edward, 1927- --Criticism and interpretation. 1985. 127 p. ; 22 cm.